The idea of having an almost unbreakable camera you can take virtually anywhere appeals to me greatly. It opens up so many possibilities of getting a shot that would have been restricted by the elements otherwise. 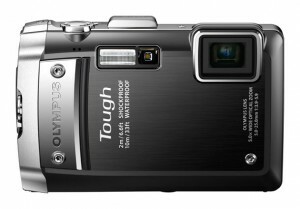 The Olympus Tough TG-810 is the top of the range camera in the Tough range and is dust proof, 10 meters water proof, 2 meters drop proof, resistant to temperatures of -10 degrees Celsius and 100kg crush proof. So when given the camera to test, my imagination immediately went wild with ideas I’ve long wanted to recreate with my DSLR but was unable to because of it’s “allergies” to water. Shooting underwater with an SLR can be done with underwater housings, but often, those housings cost as much as the camera inside them making them a lot of money spent on a type of shooting I only want to experiment with and rarely do. Waterproof compacts are quite affordable considering the strength you’re getting and so I thought would be a great alternative. Unfortunately I was quite wrong, but I’ll get to that later. When first holding the Olympus Tough, you notice how the build lives up to its name. It’s heavy for it’s size, no doubt a result of the strength of its chassis. The LCD is covered in a very think layer of scratch proof glass. Everything about it says “abuse me!” I was sad to see a higher amount of plastic in it’s construction compared to Olympus’ previous Tough range topper, the 8010. Virtually the entire outer structure of the 8010 was made of metal. On the 810, many of the panels are now plastic. But despite that, it still feels strong, but one can’t help but feel that the previous model would be more resilient. There is only one opening to the internals of the camera, where you can access the battery, charger port and SD card slot. This was done to minimise the entry points for water into the camera, and would do a great job keeping water at bay with two rubber o-rings to create a tight seal. To put the Olympus to the test, I organised an underwater shoot at a local municipal pool. I was hesitant to just jump into a pool with a camera in my hand. Doing such a thing is something I’m very wary about accidentally doing whenever I’m remotely near a body of water with my camera. Before closing the battery compartment I made sure the seals where clear of dirt or anything that could compromise the integrity of the o-rings, like the instruction manual says. I switched the camera on and slowly hesitantly crawled in to the water keeping the camera above the surface trying to delay submerging the Olympus. So using a little extra bravery, I went against instinct and dropped my hand below the water line. That’s when my heart nearly stopped. I saw bubbles coming out of the camera and thought to myself that the seals aren’t working. I immediately pulled the camera out of the water and checked the battery compartment panel, but without opening it (never open unless the camera has been completely dried as water can get in.) Everything looked as it should. I figured the bubbles were coming from the small gap between the exterior of the battery compartment panel and the first of the two o-rings. With these kinds of cameras, you need to have a little faith. I stuck the camera back in the water. A few more small bubbles came out and then quickly stopped. The camera remained on and never faltered, much to my relief. The feeling of standing submerged in water with a camera in my hand had to be one of the weirdest feeling I’ve ever had in my years as a photographer, but I quickly got used to it. Once in the water, the camera is easy enough to use. The closest mode to having full control over it is Program, where you can control ISO and whether the flash fires or not. Keep in mind this is a fully automatic compact camera, so being able to control shutter speed, aperture or manual focusing is never going to happen. It did a good enough job over exposure control. I realised then that composing underwater is very difficult to say the least, especially when not wearing goggles and the only way to really shoot is on continuous drive. The Tough has an impressively fast frame per second count and accurate auto focusing making getting the right framing possible. But right about now is when the Tough started letting me down. Just before I get deeper into that, I must mention Olympus as a whole have been quite disappointing for me in the image quality department over the last few years but have done quite a radical u-turn in the past few months. For example, their new XZ-1 flagship compact camera is phenomenally good and would be my sub-R6000 compact camera of choice with brilliant low light control and what I think is the best lens in a compact camera at the moment. I was hoping the recently released TG-810 would feature some of the XZ-1 great low light performance. But unfortunately it came no where near it. There isn’t much light underwater so shooting with high ISO’s are a must. In my particular case I had to resort to shooting at 800 ISO. Not considered high for modern DSLR’s, or even most slightly older DSLR’s. But compact cameras have much smaller sensors than DSLR’s and so don’t cope with high ISO’s as well. The Olympus’ XZ-1 proves it is possible, but the Tough suffers from really bad image quality at these heights. There is just too much noise to be corrected in post production and the noise affects sharpness to a huge degree to the point where images are unacceptably unsharp and there is a lot of image break-up. When used in normal lighting conditions that you would subject the average compact camera to, it performs reasonably well. I came to the sad realisation the the Olympus Tough is not a substitute for a DSLR in a dedicated water housing in terms of image quality. I knew it never would be, but I had hoped it wouldn’t be far behind. Underwater compact cameras are best thought of as regular compacts that you just can’t break. You can take it hiking, toss it in your bag with all your other valuables and go to extreme environments without having to worry about it. You can take it to a pool party without worrying about accidentally falling in. But don’t expect images to be any different to your average compact. If that’s all you will use the Tough for, it’s still a great camera. I had just expected too much out of it, or rather maybe just hoped for too much. I’m still of the belief that a camera that is designed to shoot underwater should be usable underwater. In this regard, the Olympus is redundant. Hopefully for future models, Olympus utilise the low light technology available in the XZ-1. And a dedicated manual mode would be a nice addition as well. If they can achieve that, it will be a fantastic camera that will be hard to fault.